From academia to corporate to military to government to entrepreneurship, Tonya Dawn Recla became a master of transformation and reinvention. She wrote the book on personal power (W.A.R. – Watch, Assess, React: The Ultimate Guide to Personal Power and Safety) after being raped by a team member on an espionage surveillance mission. Introspection and a desire for total inner freedom and autonomy led Tonya on a trail of twists and turns as she mastered her personal power, manipulated her energetic signature, and honed her super powers. When Tonya heard the call to wake-up the world and help others hone their super powers, she resisted. Her traditional, linear experience seemed in opposition to the metaphysical, energetic, woo-woo arenas. Ultimately, however, she found her WHAT in the intersection between those two worlds and has helped guide thousands of others as a result. In addition to one-on-one intuitive coaching, she and her husband, Justin, built the Super Power NET, an international personal development platform where those who operate in high frequencies can gather in a supportive training and coaching environment. Their mission is to change the world by normalizing the super power conversation and inspiring others to aim higher. 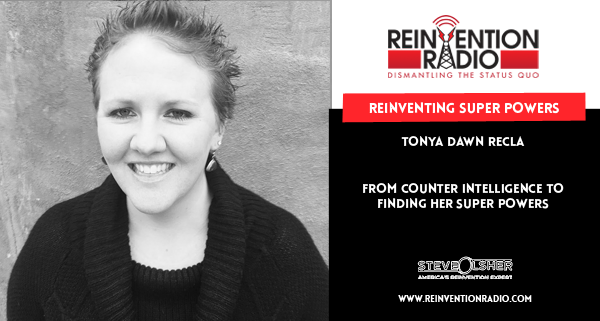 TUNE IN to this episode as Tonya chats with Steve, Mary and Richard about how she transformed from a life in counter intelligence to finding her super powers that now help others to find theirs. You will always find something wrong with you. Reinventing Missing Children – In this episode, Marie White chats with Steve, Mary, and Richard about missing children, and learning to survive with a “new normal” in the midst of heartbreak.